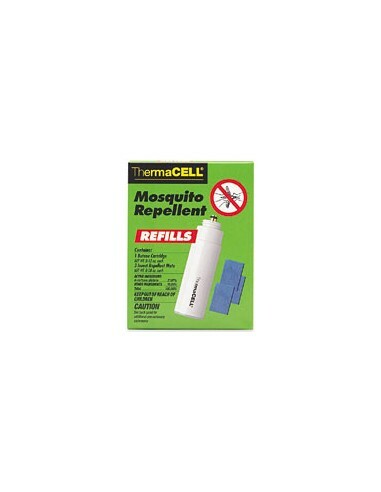 Make sure your ThermaCELL Mosquito Repellent keeps protecting you from those pesky bugs. Don't run out of refills! Single refill includes 3 mats and 1 cartridge, for a total of 12 hours of repellency. Value refill pack includes 12 mats and 4 cartridges provides 48 hours of repellency. * All ThermaCELL models use the same refills. * Each cartridge lasts up to 12 hours, and each mat lasts up to 4 hours. * Refills can be stored for long periods of time. Cartridges and mats don't need to be used all at one time. For example, one could use the cartridge and mat for an hour a day. Simply turn the unit off and restart when ready. If time between use will be more than a 1 week, store the mat in a dry, dark place. * The repellent, allethrin, is a synthetic analog (chemical copy) of a naturally occurring insecticide, pyrethrin, found in the pyrethrum flower, a member of the chrysanthemum family.